To make the shortbread, preheat the oven to 325. Line a 9×13-inch baking pan with parchment paper. In a small bowl, combine the flour, baking powder and salt. In the bowl of a stand mixer fitted with the paddle attachment, cream together the butter and sugar until light and fluffy, about 2 minutes. With the mixer on low speed, blend in the flour mix until just incorporated. Transfer the dough to the prepared baking pan and press into an even layer. Bake for 15-18 minutes or until golden. Transfer the pan to a wire rack to cool completely. For the caramel, combine the butter, sugar, corn syrup and sweetened condensed milk in a medium saucepan over medium heat. Heat, stirring occasionally, until the butter is melted. Increase the heat to medium-high and bring to a boil. Reduce the heat to a simmer, stirring constantly. Continue simmering and stirring until the mix turns an amber color and thickens a bit. 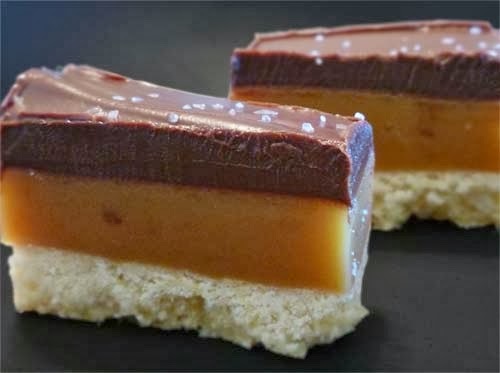 Pour over the shortbread layer as evenly as possible, and allow to cool completely and set by chilling in the fridge for a few hours or overnight. For the chocolate layer, in a double boiler, combine the chocolate, corn syrup, and butter over simmering water. Heat, stirring occasionally, until the chocolate is fully melted and the mixture is smooth, Pour evenly over the caramel layer and use an offset spatula to smooth it out. Allow to cool for a minute or two and then sprinkle on the fleur de sel. Chill, covered, until ready to slice or serve. This recipe is adapted from Eats Well with Others. The amount of ingredients have all been adjusted to half of the original because I was making a smaller amount. The rest of the instructions is also better followed from that site. I'm getting acclimated to the taste of salted caramel. That may or may not be a good thing.